How often does your Smartphone fell down from your hand? If the frequency is way too high per day, it’s time that you should think about having a case for your Smartphone, especially when you have spent a huge amount to buy that device. 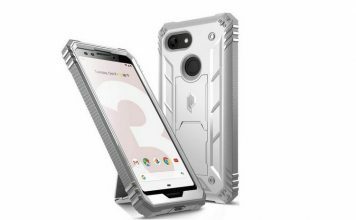 Since Smartphone cases are available for both protection and styling purpose, you should find a bumper case for your device, especially when you want protection in a ‘rough’ scenario. For instance, if you have dropped your device from a height of 10 feet or subjected to heavy rain or dust, only a rugged bumper case would be able to protect it. At the same time, you need to make sure that the rugged-design doesn’t curtail access to buttons and ports. As we come to the case of slimmer yet larger devices like iPhone 6s Plus, the requirement becomes more or less a necessity; it’s so because a strong strike on edge of iPhone 6s Plus would bring you hell. Lately, we had brought you a list of top 10 bumper cases for iPhone 6s. Today, we have come up with the list of bumper cases for iPhone 6s Plus — we hope it helps. 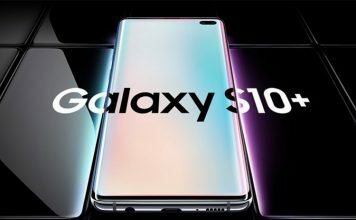 We start this list with a stunning bumper case from Spigen, a name that is trustworthy when it comes to accessories for smartphones. It’s a purely transparent case, so you won’t lose the real beauty of 6s Plus of yours. On the outer layer of the transparent protection, we find the hard Polycarbonate while that inner layer is made of Thermoplastic Urethane that’s quite flexible and this is what makes the bumper impressive. On edges of device, Spigen Crystal Clear iPhone 6s Plus Bumper Case has included Air Cushion Technology that can be very useful when subjected to drops and other impacts. Other features of the iPhone 6s Plus bumper case include raised bezels, pronounced buttons, larger cut-outs for easier connections and a slimmer, bulk-less design. Made specifically for Apple iPhone 6s Plus, this protective bumper case is a blend of hard Polycarbonate and a softer TPU; while the former material protects the device body from dust, dirt, water etc, the latter is flexible enough to get you best protection if you drop your phone. To make the design comfortable, POETIC has used X-FORM Poetic DNA. The case is transparent even when it offers state-of-the-art protection for device edges. Talking of the TPU-made layer, the surface can be quite effective in shock dissipation, though its thickness has been brought to the minimal amount. Other features of POETIC Affinity Dual iPhone 6s Plus Bumper Case are: anti-slip side grip for easier handling, inner ridges for advanced shock dissipation, raised bezels and access to all the required ports. 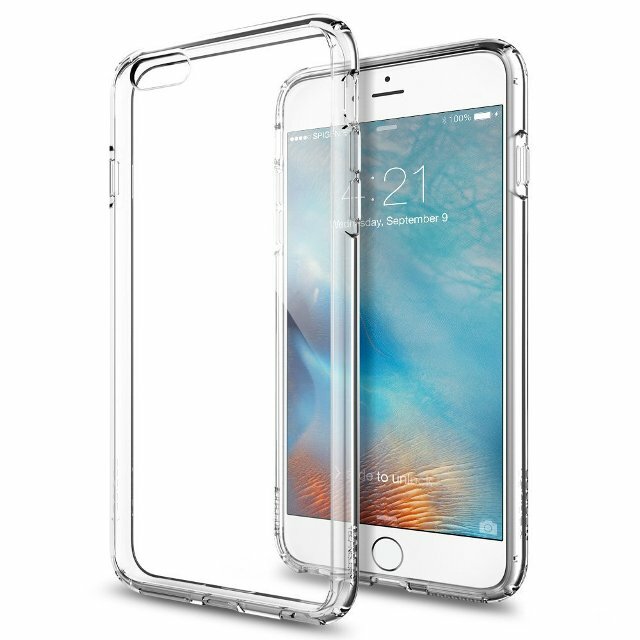 When you want to have an impressive-level protection for your iPhone 6s Plus even while maintaining class outlook, SUPCASE Clear Hybrid iPhone 6s Plus Bumper Case would be a nice choice. Despite having the sturdy layer of softer TPU bumper and the harder Polycarbonate layer for optimal protection, the case has kept minimal amount of bulk & it would be feeling just awesome to hold your iPhone 6s Plus. The TPU bumper has been optimized in a way that you will have to face not much impacts from shocks and bumps. In addition to these, SUPCASE Clear Hybrid iPhone 6s Plus Bumper Case has some other stunning features as well. while it gives special area for buttons, thus enhancing usability, raised bezel would do good when you place your iPhone 6s Plus upside down. 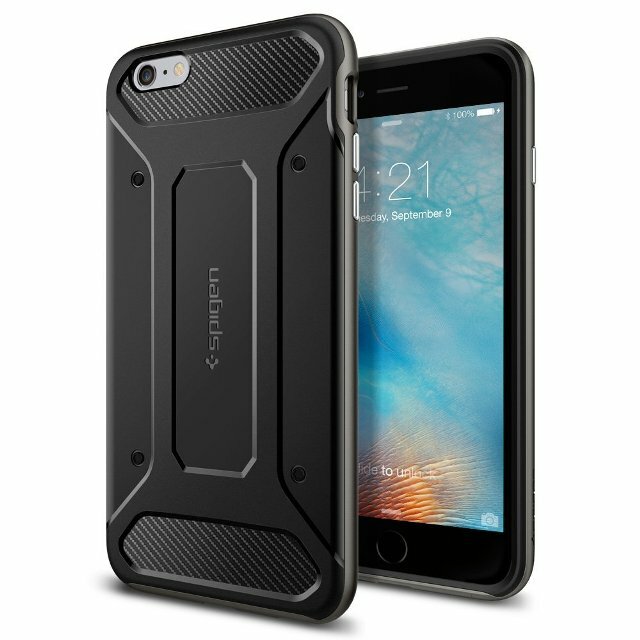 Included in the Gunmetal series of Spigen, Gunmetal iPhone 6s Plus Bumper Case is a great choice when you need the protective case to be rugged and most protective. Well, it needs to be noted that the case is an expensive choice, at the same time. 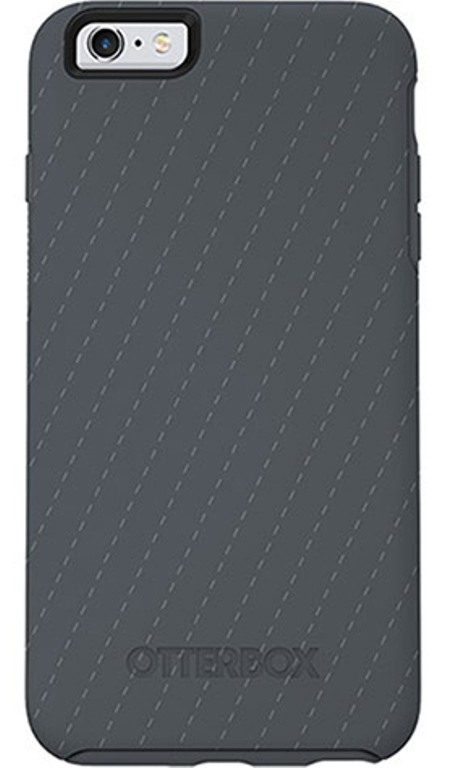 The case comes with reinforced bumper that’s quite effective during worst-case scenarios. Of course, the dual layer consists of hard Polycarbonate and the flexible layer of Thermoplastic Urethane and on top of these, there’s a carbon fibre pattern and gloss finish, so that you get a good holding feel. 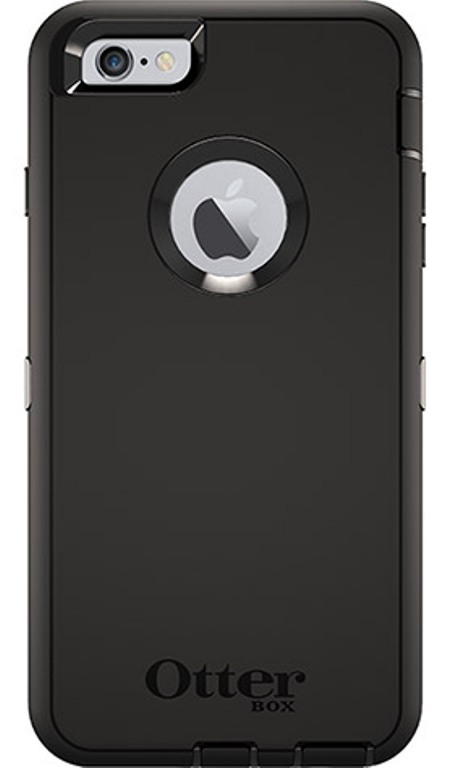 Other features of Spigen Gunmetal iPhone 6s Plus Bumper Case include bigger cut-outs, pronounced buttons, raised lips and camera cut-out, etc. 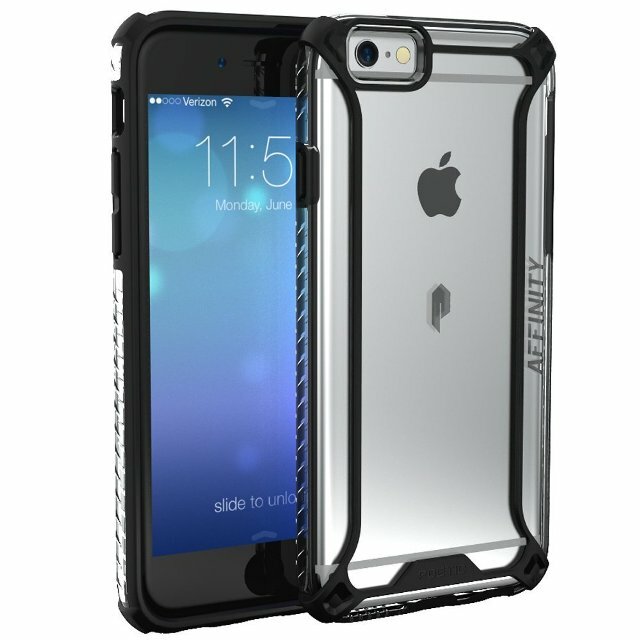 In short, the case is capable of delivering top-notch protection from common obstacles and drops, even up to a level that the price becomes way too reasonable. 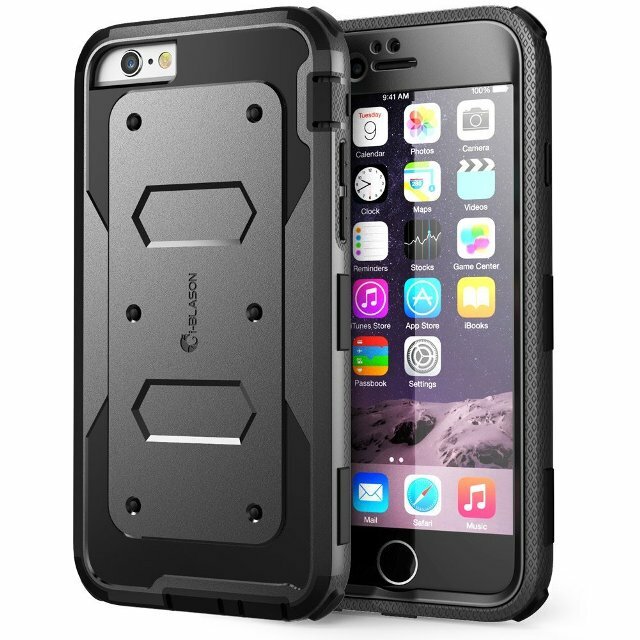 Yet another rugged-type device protective solution, i-Blason Armorbox iPhone 6s Plus Bumper Case is available at a relatively affordable price range. As it’s been designed exclusively for iPhone 6s Plus, you can be sure that you’ve access to all the ports, speakers, buttons etc. And, as in the case of buttons, you also get a classy feel when you press those pronounced buttons. It’s to be noted that i-Blason Armorbox iPhone 6s Plus Bumper Case comes with a built-in screen protection, in case if it is harmed and the protective layer consists of two materials — the bumper made of flexible TPU and outer shell with Polycarbonate layer. In addition, its dotted pattern layout enhances TPU core as to improve shock absorption. The best feature we found in the case is its complete-level compatibility with all iPhone 6s Plus features out there. With a built-in screen protector for your iPhone 6s Plus, JETech Fortress iPhone 6s Plus Bumper Case is a nice choice, when you need to have best-in-class protection along with easier handling of device. You need to get rid of current screen guard before you install this case. Talking of design and build, the case is depending upon 2-piece principle & the bumper and build is so effective that it can withstand drops even from a height of 10 feet. 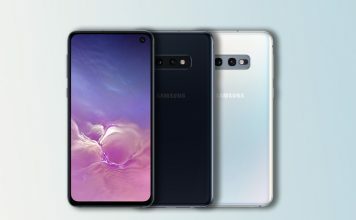 Talking of the included screen guard, it gives a natural touch feeling even while offering protection from common obstacles such as dirt, oils, dust etc. 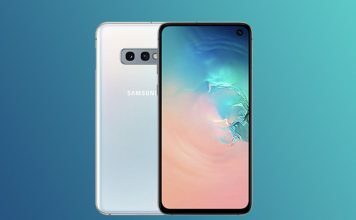 If all these features and a substantial pricing of the case doesn’t make sense to you, you should have a look at it, and you’ll know why we say it’s best. 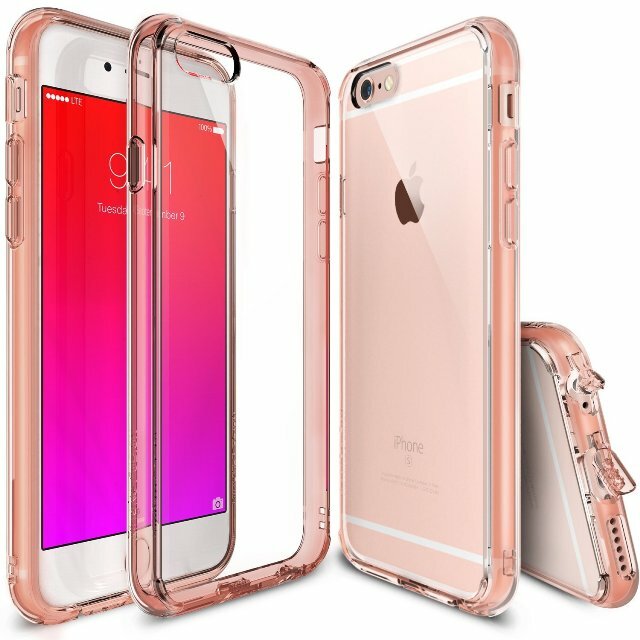 Ringke Fusion Clear iPhone 6s Plus Bumper Case is available at an affordable price and the transparent case offers an impressive range of features as well. TPU-made bumper of case has been enhanced using Active Touch Technology, and thus it ensures access to ports, buttons, speakers etc. Along with access to ports, there’s a dust cap. So, when it is not in use, you can make use of the dust cap to make sure that dust doesn’t affect your iPhone 6s Plus. By the way, when you purchase Ringke Fusion Clear iPhone 6s Plus Bumper Case, you get a free HD screen guard as well as a DIY template to customize your case as you like it. Other features are specialized tight grip, dual coating, easier access to buttons etc. And, customers have superb opinions about the case, for that matter. 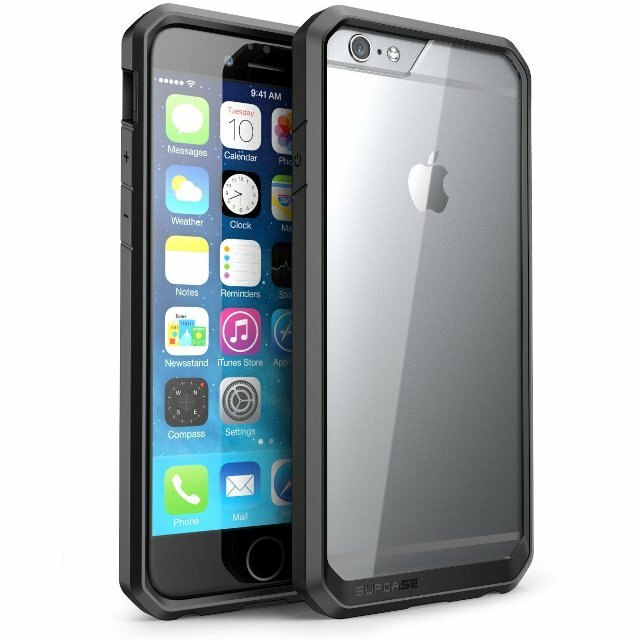 AILUN Toughened Frame iPhone 6s Plus Bumper Case is the most affordable bumper case in this list, but it offers a n impressive amount of features, accompanied by ease of use. While Soft TPU has been added to its edges, toughened frame fully transparent back design add productivity in the long run. When we come to the case of device body, the design becomes semi-transparent and there are some other features as well. For instance, there’s raised lips for the camera section and screen section, so that you can place the device as you want. 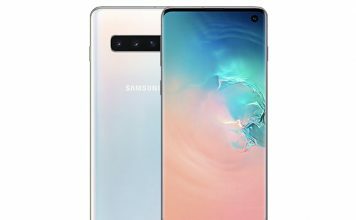 By the way, the outer coating is of harder Polycarbonate that has a Ultra Violet coating as well — say goodbye to fingerprints, scratches, smudges etc. in short, AILUN Toughened Frame iPhone 6s Plus Bumper Case can give you an overall protection, from different sort of angles. From the Defender series of OtterBox, this bumper case is a good choice when you’re ready to pay more for the top-notch protection you get. 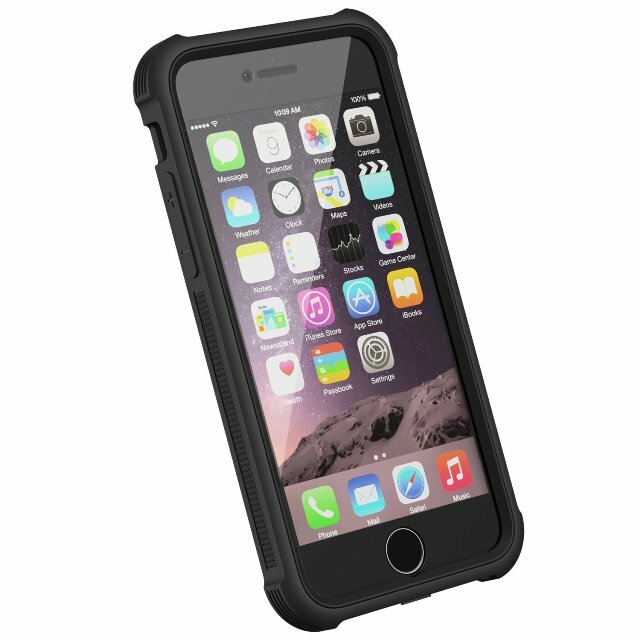 OtterBox Commuter Series iPhone 6s Plus Bumper Case comes with multi-layer design, on which the firm has done enough military-grade tests to prove durability and strength. Moreover, the case has a one-year warranty, in case if you would have a problem with that. In addition, edges of the case have been optimized as to bring the impact to minimal level, along with some other features. Some of those features are: in-built protection for screen, triple layer defence, port covers for protection from dust, holster. It needs to be noted that the case uses synthetic rubber and polycarbonate for creating bumper and outer shell. It’s available in Black, Glacier and Hibiscus Frost colour variants. This is yet another bumper case from OtterBox that brings the beauty of graphics design as well. Even when the case is going fine with the standard tests run by OtterBox, its slimness has not been affected and you can use the case as if it’s a small layer over the device. There’s isn’t an included screen protector, but OtterBox Symmetry Series iPhone 6s Plus Bumper Case will be very impressive as we come to the case of drop protection as well as scratch protection, along with other common obstructions. In addition to the bumper, raised edges add a bit more safety to the body. This pocket-friendly case is available in different pattern variants like Penstrips, Under My Skin, Graffiti etc. Which bumper case would you choose for your iPhone 6s Plus, out of the aforementioned cases? We would love to know.